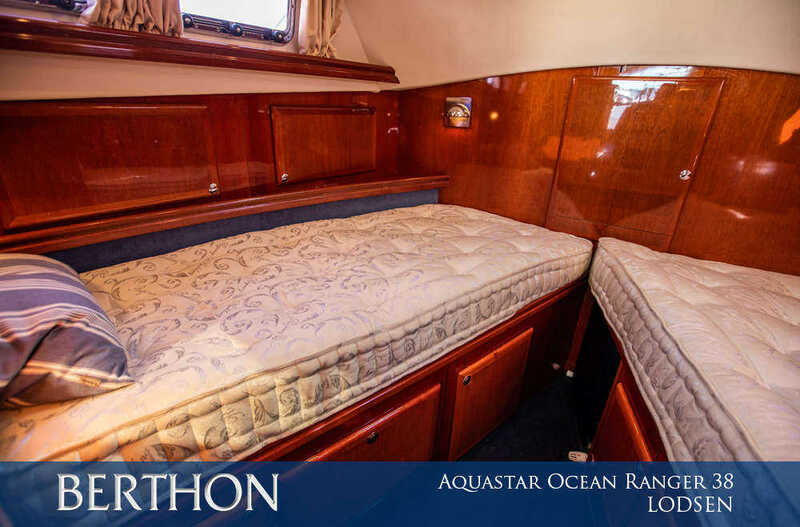 Home » Berthon Blog » Aquastar Ocean Ranger 38, LODSEN – A Reliable and Tough Sea-Boat Ready to Go! Aquastar Ocean Ranger 38, LODSEN – A Reliable and Tough Sea-Boat Ready to Go! For those of us who put to sea regularly, the Channel Islands are a huge draw. With enjoyably challenging navigation, great cuisine, stunning beaches and a fascinating heritage, they are a wonderful location to explore, and the arrival after a good Channel crossing makes sure that you know that you have deserved it. The rocky shores, confused seas and fast currents of Guernsey have always required a tough sea-boat to deal with the native waters, and Aquastar moved their original production (mainly work-boats built in the New Forest) onto Guernsey in the mid 1970’s – with a diverse range of builds from heavy trawlers to commercial patrol boats. The original plans for the 38 were drawn up in 1978, following the success of her smaller 33’ sister – so this is a very well-proven yacht concept, and the 38s, and 118s after them, continue to provide sterling service. Thus we come to the 2002-built “Lodsen”. Built for a very specific first owner (she is now with her third custodian from new), she is the aft cockpit variant, running on a pair of reliable, well-serviced Volvo KAMD300 six-cylinder diesels, with a relaxed speed of 12 knots and faster cruise at 17. Both engines are very accessible, and the entire saloon floor is sectioned for inspection, with the generator mounted directly between the prime movers. There is noise-suppressing insulation beneath each sole-board, further soft matting and a carpet to reduce noise levels as far as possible. She is of course shaft-driven – so her weight is balanced well forward, and her mechanicals are uncomplicated and robust. The Aquastar hull profile is round-bilged, drastically reducing any slamming moment that flatter-sectioned planing hulls tend to suffer from, and making life on a longer passage far more comfortable and less tiring. With massive lay-up, chunky deck gear and purposeful looks, the 38 is an established semi-displacement motor-yacht of choice. Being the aft cockpit layout, there is a vast lazarette area beneath the teak-laid aft deck, with fuel filters mounted to starboard and the fuel tank forward. Dinghies, deck furniture, cruising kit and spares can all be stowed in here, with a set of deck lockers around the cockpit providing useful storage for warps and more immediately-needed items. Safe coamings and stout grab-rails lead forward to the side-decks – but these are not the skinny, elevated skate-rinks of the fast cruiser, but are wide flats, laid with teak, with a decent moulded toerail. They are safe and low enough to the water to make boarding and disembarking on a marina a far less difficult proposition, and “Lodsen” can, and has, handled inland passages as well as seaways. Internally, her mahogany joinery is practical and hard-wearing, and the fit-out is right at the zenith of Aquastar’s craft, with adjustable Besenzoni seats for helm and navigator, a proper chart table area, hot water radiator heating for constant temperature, a neat dropped galley area and a large heads compartment with a separate shower stall. Up in the bows cabin, there are two single berths measuring in at a full 2 metres’ length, with plenty of storage in drawers, lockers and the hanging locker (with access up into the chain locker). With proper sprung mattresses, it’s own radiator and plenty of opening port-lights and a deck-hatch, this is a really pleasant place to read and rest. So, if you are looking for a properly built, semi-displacement true “blue boat”, then please do call us for an appointment to view. She is out of the water with us here at Berthon, and remember – we are open seven days a week!